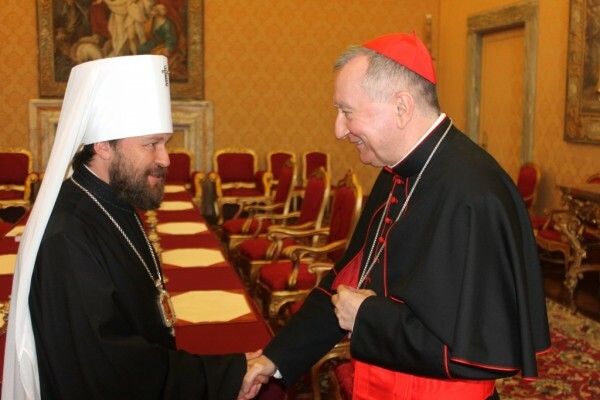 On June 26, 2015, Metropolitan Hilarion of Volokolamsk, head of the Moscow Patriarchate department for external church relations (DECR) met with the Vatican Secretary of State Cardinal Pietro Parolin. They exchanged opinions on a wide range of issues including relations between the Orthodox and the Catholics in Russia, Ukraine and Belarus. The DECR chairman shared impressions of his recent visit to Belarus in a delegation that accompanied His Holiness Patriarch Kirill of Moscow and All Russia and expressed satisfaction with the positive development of Orthodox-Catholic relations in that country. They agreed on the need for closer cooperation between the two Churches in seeking a peaceful settlement of the situation in eastern Ukraine and giving aid to those who need it. Special attention was given to the situation in the Middle East where the blood of Christians is spilt and the humanitarian disaster has reached an unprecedented scale. On the same day the DECR chairman met with the President of the Pontifical Council for the Family, Archbishop Vincenzo Paglia. They discussed a wide range of issues concerning the common responsibility of the Orthodox and the Catholics in defending the traditional family. Archbishop Vincezo invited Metropolitan Hilarion to take part in the Congress of Families to take place in Philadelphia, USA, in September 2015. In the evening of the same day, Metropolitan Hilarion met with the President of the Pontifical Council of Promoting Christian Unity, Cardinal Kurt Koch. They dealt with a wide range of issues reflecting the present state of Orthodox-Catholic relations. Metropolitan Hilarion shared his impression of the meetings held by the Drafting Committee of the Joint Commission for Theological Dialogue between the Orthodox Church and the Roman Catholic Church as the committee worked on a draft document on ‘Towards a Common Understanding of Synodality and Primacy in the Church in the First Millennium’. Its edited version will be presented to the Joint Commission’s Coordinating Committee at its meeting in September 2015 in Rome.